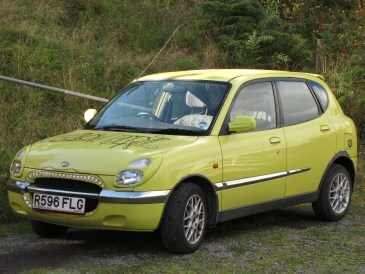 Daihatsu Sirion: Cosmetics and more – HubNut – celebrating the average! Today’s main aim was to improve the cosmetics. That involved removing most of the artwork and then giving the cleaned panels a good coat of polish. Removing the remnants of old stickers was very hard work. I tried carburettor cleaner, electrical contact cleaner, white spirits, brake cleaner and tar & bug remover. Eventually, the rag which was by now soaked in all of the above managed to clean the gooey, gluey mess off the paintwork. I’m very pleased with the results. 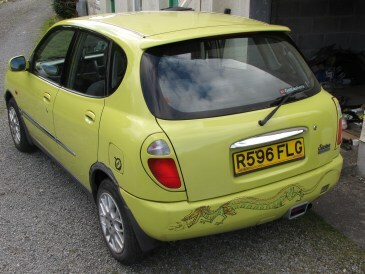 For the moment, I’m keeping the roof-mounted bird and the Yellow Peril bonnet artwork. Both may yet go, but I’m in less of a rush to get rid of them than I was some of the other stuff. I’ve kept one Muttley on the offside rear quarter too. You can just about see in the shot above that I’ve also tackled the rot in the rear wheelarches. It’s going to need some welding at some point, but I’ve rubbed back to decent metal and treated what is then visible for the time being. I did discover some shoddy repairs. The tailgate has many shades of yellow upon it as whoever repaired some previous accident damage clearly couldn’t be bothered to paint the whole tailgate. I can’t say I’m that bothered though. Adjusting the rear washer was a pain as I had to remove the rear spoiler to do so. Great design! Fortunately, three nuts are all that hold it in place. I also changed all wiper blades and gave some parts of the underside a soak in anti-corrosion wax – namely the front crossmember and subframe mountings. I almost checked the gearbox oil level too, but that can wait for another day, and possibly use of a ramp to make life easier. 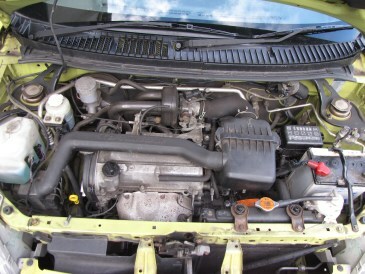 As you can see, despite the dinky engine, underbonnet access is still quite tight. The radiator and battery also seem to be scaled down! I’m still very pleased with the car. I only really sold the Golf because the tax was up at the end of this month. The downside of a 1.6-litre engine is that it is just over the 1550cc cut-off for Vehicle Excise Duty. That means 12 months costs £225. That’s a lot of money to find at once, especially when I’ve recently had to tax both the 2CV and Land Rover. In fact, it angers me that road tax for older cars is so ridiculously expensive. Some moderns are super-cheap or even free. That doesn’t seem fair. A Golf costs as much to tax as a 6-litre Jaguar XJS-R. That’s just lunacy. As it is, the Sirion doesn’t need taxing until the end of November, and will only cost £140 for 12 months. That definitely helps, and so should the theoretically better economy. I’m looking forward to finding out just what it’s doing, but it has only used quarter of a tank in the 120 miles I’ve covered so far. Shouldn’t take too long to use the rest up I reckon!